Last night, the nine remaining singers on American Idol took on the Lennon-McCartney songbook (or the McCartney-Lennon songbook, depending on whom you ask). The outcome was uniformly solid but rarely transcendent — only about half of the performers satisfyingly combined creativity and competence, but hey, it’s not even down to the top five yet. The theme for the behind-the-scenes videos last night was “What do the other contestants have to say about the next singer?” For instance, we learned that Aaron Kelly’s Idol compatriots like to repeat everything he says back to him in a Yoda voice. At first it seemed a bit like older sibling–style condescension, but then you saw his smiley elf face and button nose and remembered that you’d probably give him a noogie yourself if you met him in person. Aaron unsurprisingly opted for a treacly ballad, which last night was “The Long and Winding Road.” His take on it was about as boring and joyless as the original, but he doesn’t have the “Hey, I’m Paul McCartney, so shut up” excuse on his side. Still, he’s vocally talented for such a young age, so he’ll be sticking around another few weeks. Before Katie Stevens sang, Ryan Seacrest told us a handful of eligible bachelors/Idol fans/complete strangers have asked her to prom. Katie let her potential suitors know she would require phone bills to verify her potential date had consistently voted for her, which should sure go a long way to disabuse those who think she’s all drive and no passion. Katie stayed in her comfort zone with a sleepy take on “Let It Be.” Her vocals were adequate but not convincingly passionate, which is something you really need if you’re going to sing a near-religious rock classic. She even sounded a bit flat while striving toward the higher notes; Randy didn’t mention this, which is shocking considering his only job here is to serve as a pitchiness alert system. All of the judges heartily approved of her performance, perhaps because they felt bad dumping on her so many weeks in a row. Or maybe these cute kids are great for ratings. Michael Lynche’s overwrought “Eleanor Rigby” may have been a valiant effort at recasting the chamber-pop classic in modern R&B terms, but his stop-start vocal indulgences left the whole thing off-putting and melodramatic. Randy said he could imagine this song being a radio hit (seriously, on what station?) or on Glee (Ryan Murphy probably knows better), while Kara felt it could be a track on his album, although in her defense she might have meant a record that will go straight to the bargain bin. The ever-reliable Simon called it out as senselessly theatrical, so madness did not rule the day. Andrew Garcia provided an unusual take on “Can’t Buy Me Love” by slowing down the tempo during the verses and adding a thin layer of soul-pop cheese. The bombastic arrangement didn’t exactly gel with his vocals, and oddly enough the whole thing sounded like it might have been yanked out of a long-buried time capsule from The Lawrence Welk Show. At the very least, the song choice allowed Ellen to make the best joke of the evening, when she asserted that one can buy love and then asked the recently engaged Simon if he agreed. Zing! Andrew also popped up in Lee DeWyze’s video, with the two falling prey to a typically Idol “Are they gay or what?” joke routine. Since the two husky guitar slingers bunk together and have become inseparable BFFs, the other Idol hopefuls have decided the two are “like brothers or dating” and will one day produce Danny Gokey babies, which is actually very conceivable (mentally, not literally). After a game-changing performance last week, Lee played it safe this time with “Hey Jude.” He didn’t do much to the song other than cut down its seven-minute run time and throw in a bagpipe toward the end. Was this a nod to McCartney’s 1977 U.K. smash hit “Mull of Kintyre?” Either way, Simon didn’t like it. While his white soul voice was in fine form, it felt like he was leaning on audience participation (which he encouraged) as a crutch. He wasn’t as bad as the guy who pulls out an acoustic guitar when the frat party is winding down, but he straddled the line. The judges mainly went for that “I didn’t love it but I’m still a fan” gobbledygook, which means nothing since they’ve used it on everyone at this point in the season. 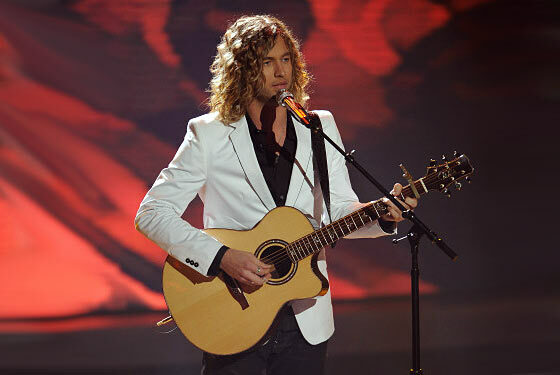 Even though he’s been a consistent performer, Casey James’s stunning take on the John Lennon solo track “Jealous Guy” was shockingly authentic. He’s generally been more of a rollicking-good-times singer, so the soulful, honest pain he brought to the tasteful arrangement (just his acoustic guitar and a cello) was a real surprise. He inhabited the song as if it were his own for those few minutes and came across as the type of performer who could embark on a lengthy tour and still manage to bring the passion every night. Check out Casey James’s (whistling-free) take on “Jealous Guy” below. In response to the repeated criticism that she leans on her big screechy note too often, Siobhan Magnus revealed a gentler side with a lovely take on “Across the Universe.” Looking dapper as a hipster on eighties-prom night in her faded wedding dress and gray vest, Siobhan proved she could do the tender warmth thing in addition to her usual electrifying weirdness. It’s always hard to command the Idol stage with a subdued performance, so if you just saw her sing for the first time last night, you might wonder what all the fuss is about. But after weeks of hitting those huge notes, she made the wise choice of demonstrating her range as a vocalist. Simon challenged her to explain why she related to the song’s lyrics; it was a trap he had earlier sprung to expose Aaron as not connecting to his song. (It’s, like, a long and winding road, which is long and winds. Just like American Idol!) Tears welling at the corners of her eyes, Siobhan started talking about her little sisters and how she wouldn’t let Idol change their relationship. Her explanation wasn’t terribly clear, but its emotion passed the Simon test, who nodded and mouthed, “Good answer” to Kara. Then Ryan allowed some idiot who had been hootin’ and hollerin’ throughout the show to come onstage to hug Siobhan. Seacrest, you should never encourage a guy named Earl. Bowersox went for the soulful grooves of “Come Together.” Even if it was a bit obvious for her, the unnecessary and therefore awesome addition of a didgeridoo to the song was inspired. After a minute or so of her fairly straight Joe Cocker–style reading of the song, Crystal let loose with some vocal flourishes that were soulfully sassy without ever being indulgent. Because she’s the best thing to happen to this season and they know it, the judges all praised her roundly. Kara got bonus thesaurus points for calling the performance “slinky, playful, and accessible.” Then Ryan beckoned Ernie (the freelance didgeridoo player) back onstage and tried to milk the funny-sounding instrument for all it was worth. Tomorrow night: R&B superstar Rihanna pops in along with “Whatcha Say” singer Jason Derulo, as well as season-seven runner-up David Archuleta, who will probably pull a revolver on Aaron Kelly by the O.K. Corral and declare that the teen-pop-for-moms target audience ain’t big enough for the both of them. And kudos to the AV Club’s Claire Zulkey for predicting two of last night’s song choices a full week in advance.